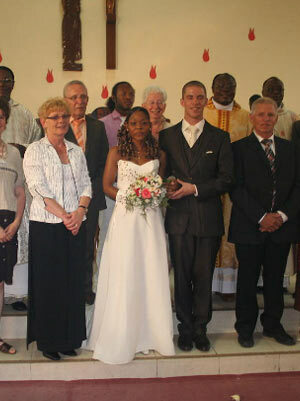 In June 2008 our two founders (Rod and Mandy Unger) were invited to the wedding of two friends, Teun and Anoma, which was held in Togo where Anoma's ancestors come from. A thrilling and unique experience for them and as a result Togo came in to their lives. As a part of the week-long celebrations in Togo they visited the village of Anoma's ancestors, Agome-sevah, which is on the river Mono the border between Togo and Benin at this point. The people of the village were wonderful and could not have been more hospitable, even though they did not know they were coming as there was no way to let them know! As was said at the time somehow they semed to give a lot more than they had. They have very little! Agome-sevah had no clean water and still has no mains electricity, no proper roads, no industry, no sanitation and no medical facility to speak of. As result many of the villagers with anything about them felt they had to go to the capital, Lome, to try to make a living there. For all these reasons the village is struggling as you will see from the photographs taken at the time. Rod and Mandy initially committed to do two things. Firstly they committed to and have already provided some micro finance, so that the people of Agome-sevah could begin to set up small businesses, acquire things for the benefit of the whole village and then repay the loans, so that someone else can then have a chance of setting up their business. Next, they committed to helping them get their school up and running. Dekamile raised some more money to provide them with a roof for the school as the previous ones leaked!! Dekamile also provided them with all the text books they required and many, many other basic things they did not have. See other links on the website to learn what else has been achieved.